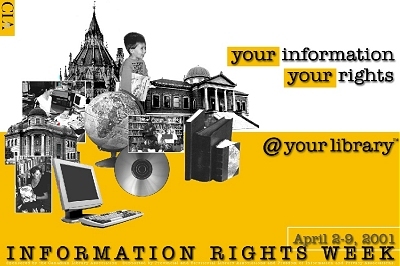 Information Rights Week 2002: April 7-13.
mark Information Rights Week which is celebrated nationally. transition, topics relating to access to information are being discussed daily in the media, amongst colleagues and in our communities. Mark your calendar for the following events, and please note two require pre-registration. "Ensuring Accountability in a Time of Restraint"
Monday, April 8th, 7:00 P.M.
Free; no registration necessary, but come early as seating is limited. 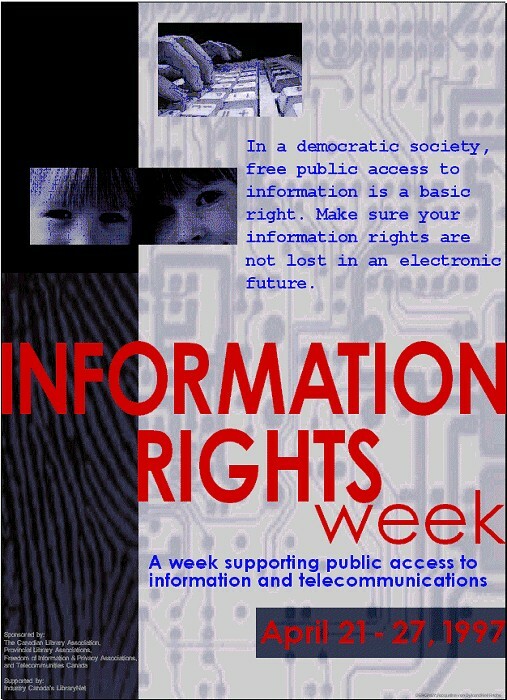 2/ Public Workshop: "Your Freedom of Information and Privacy Rights"
Thursday, April 11th, 7:00 P.M.
3/ Government Publications annual IRW workshop -- "Access to Legal and Government Information in the 'new era'"
BCLA's Information Policy Committee will be co-sponsoring two events in Vancouver. 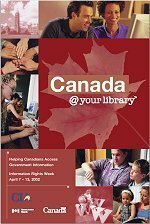 Librarians and others will discuss areas of common concern including the pricing of BC Statutes and Regulations, and the BC Depository Library program. There will also be update from the Legislative Library and a report on citizen access to government information in the U.S. Sponsored by the Government Publications Committee, BCLA. Brief presentations by Penny Goldsmith (Coordinator, PovNet), Heather Menzies (activist and writer) and Brian Campbell (librarian and advocate for information equity through libraries and community networks), will be followed by a chance to talk informally with these folks and others who have contributed to a new book "E-commerce vs. E-commons: Communications in the Public Interest". This book, edited by Marita Moll and Leslie Regan Shade, has just been published by Canadian Centre for Policy Alternatives. 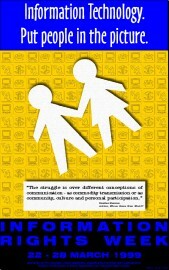 It offers both informed analysis and insights by media activists from across Canada. Books will be available for sale. Refreshments will be served. Co-sponsored with the Canadian Centre for Policy Alternatives, PovNet, and Vancouver Public Library. For more information on the Vancouver events, please contact the BCLA Office at 683-5354.. Event information and other details will be posted.